I'm planning to have a WB2B-19 installed, with only one circuit - heating through steel panel radiators. In terms of heat control, I understand that ODR + constant/permanent recirculation is beneficial and will offer a true 'cruise control' to a hydronic system. On the other hand, I am aware that due to technological constraints, the mod/con boiler cannot 'modulate down' too much (to comply with the reset curves and to consume only the minimum volume of gas necessary to satisfy the ODR model). I gues s for reasons as simple as too weak and un-stable flame. Thus, an ODR-driven control would suffer of some "wrong impedance matching" problem at relatively warm outdoor temps. And I'm thinking that we could compensate for this "weak point" of ODR by using a room thermostat. Which would serve only the role of "high temp limiter", and with no setback. The main goal is not to mess with the ODR (Vitotronic 200 + Vitotrol 300) logic at relatively low temps. But to help the system being more efficient (i.e. cut the gas off and the recirc pump completely) when the ODR cannot anticipate properly unusual gains of heat in the house (sun or simply the speed at which the heat leaves the house is much slower). So, what I would like to to is to have a "bang-bang controller" such as Room Thermostat, which should turn the stuff off when the temp is too high (since the boiler cannot modulate too low, it will attempt to burn at a min rate and which is not optimal for the current demand and such too much gas will be consumed). I was reading through numerous posts (especially those from Chris), and still I failed to understand how the Vitotrol 300 really works. It does have a temp sensor and we know also that it helps the Vitotronic 200 downstairs to get an internal temp feedback and shift the currently selected heating curve up or down. BUT the main question is: is Vitotrol 300 really capable of telling the boiler to come to complete stop? Does it have also a bang-bang type of control (on/off)? -What is that Plug 143 (pins 2+3) meant for ("external blocking"). Chris is repeatedly explaining that it's not meant to be a TT. I understand that the other pairs of pins (1+2) serves a more complex purpose ("external demand" i.e. snow melting and forcing the boiler to be in "slave" mode and comply to some min water temp, and turn off some pumps, but only of a limited time). What about the "external blocking". Why can't it be used to tell the boiler to "stand by"? Also what kind of thermostat would be compatible with those pins? Is dry contacts expected or it's something that has power inherently? -The same question about the mysterious Plug 96. Is that a reminiscence from the Vitodens 100 - used for line voltage thermostats from Europe (230V)? In our case 110V? Could that be used as a TT? -Also, Chris was mentioning that it's possible to impose an upper limit to the modulation rate of the boiler (i.e. when you are oversizing the boiler for certain reasons, i.e. in his case his total heat loss was in the 40KBTU/h range but he wanted to have good DHW heating). In my case, I won't have DHW, only one primary heating circuit, and with a total heat load of 30-35KBTU/h (3.0/3.5gpm max flow rate). Maybe from a fuel cost savings perspective it would be nice to tell the boiler up-front not to goo too high with the gas valve? Is there a "Coding Level 2" setting for that? -Are there any North-American standard, low-voltage thermostats compatible with Viessmann Vitodens 200 / Vitotronic 200? There are some which can offer also a pair of dry contacts, such as the eco-bee. It would be interesting to be able to drive both the heating (for Viessmann) and A/C (for a standard A/C system from North-America) via the same RT. My main goal is to try to avoid using the Grundfos Alpha dP pump (which will be the only pump in the system) running when not necessary and also to have the boiler not firing unless the bang-bang 'controller' validates that the rooms do need heat.I wish to save energy overall. It seems a bit strange at first to try to marry an ODR principle with a RT (on a 1st view seems like 2 conflicting interests), or also trying an ODR + electronic TRV (i.e Danfoss Living ECO) scenario. Is an extension of the boiler control which acts like a thermostat. It will also provide the boiler with indoor temp feedback. Let the TRV's on the panel rads do their job and get the system running on constant circulation. The most efficient way to run the Vitodens. You can program set back, scheduling, have control of DHW and the control will provide any fault codes. Goes up in the living space on the wall where your normally your t-stat goes. You don't need a thermostat to run the Vitodens 200. Use the TRV's to balance the room temperature or use the Vitotrol if you must. The Alpha will work well with panel rads and the TRV's. Make sure the low loss header is used with sensor, if flow rate exceeds 6gpm. The boiler comes with a sophisticated outdoor reset control. The boiler will idle when there is no demand or be in warm weather shutdown. The ODR can anticipate weather changes and if internal solar gain is an issue, the vitotrol 300 has an internal sensor that can be enabled, if desired. This is not a boiler that wants to be operated by a regular thermostat. If installed correctly, the appliance will be very efficient and save fuel. Take the Viessmann Vitodens class at the Rhode Isl., Waterloo, Ont. or Surrey, BC locations if you really want to know how to maximize the efficiency of the appliance. on Viessmann behalf by allowing the wb2b to be controlled also by an on/off thermostat? I understand that it's aiming to use an 'European approach' / const circ based system. What about those situations whereas the boiler couldn't modulate down enough? It's bizarre that Viessmann wants us to follow only one single approach. It is very funny that there is a trend now in Europe completely opposite - people is trying now to save more on gas and electricity bills and complement their installations with an off/on room thermostat and other devices such as those from Danfoss, to completely stop both the boiler and the pumps. If Viessmann is so stubborn with their "German mindset" and way of seeing things (i.e. inflexible) with their Vitotronic stuff, then I shall pass and maybe go with a Triangle Tube or other boilers. And this comes from someone originating from Europe. I was hoping that some pros from this forum who have been working a lot with Viessmanns would shed more light on these aspects. Why so much secrecy and cryptic documentation from Viessmann? Vitodens in North America as you are in Europe. The installer across the pond has more control. The boiler even here is only going to fire if it needs to. Thus why we use a supply temp sensor. There is no "TT" on the boiler. You could use the 143 plug, ie, external demand if you want an on off system. I don't understand the logic of wanting an on/off system especially with panel rads. With adding the Vitotrol you can program set point heating schedules. There is nothing hidden in the Viessmann manual. You just have to understand it. In the next few months the new Vitodens 200 will be here featuring the same control being used in Europe as well as Vitocom giving you access to the boiler via IPhone, IPad, Andriod App. You can find the Vitotrol Showcase Demo in the ITunes App Store. to the following scenario: The Vitotrol 300 (or the 300A model - available only in Europe, and which seems to be smarter design) is set to have a setpoint temp of 22 degree Celsius. Now, the ODR does its own calcs and also uses the indoor temp as feedback. What will the ODR do - will it always try to make the boiler modulate down and provide the lowest water temp possible, in such way that the target temp will never be achieved exactly indoor? In such way that it try as much as possible, to fire the gas as longest as possible? OR there will be moments when the (real) indoor temp will get to 22.5 Celsius and then the boiler will stop firing for sure? I am concerned mostly about situations where - even with a low heat curve, the boiler will still fire in warm outdoor conditions. Because of that min modulation limit. and that article itself is admitting that ODR has its own problems when there is an imbalance between what was estimated and what the real speed of heat loss is (negative variances caused by winds and positive ones caused by sun, computers, persons in the room etc). About the training in Waterloo: I have tried to get an answer from the Viessmann headquarters, and expressed my interest in attending their training session together with my father. But absolutely no reply from them. Why so much disrespect for the residential customers, I simply cannot comprehend. This looks like arrogance to me, or the result of this excessive "market protectionism" which seems to happen here in Canda. Honestly, I am starting to be very disappointed in Viessmann. 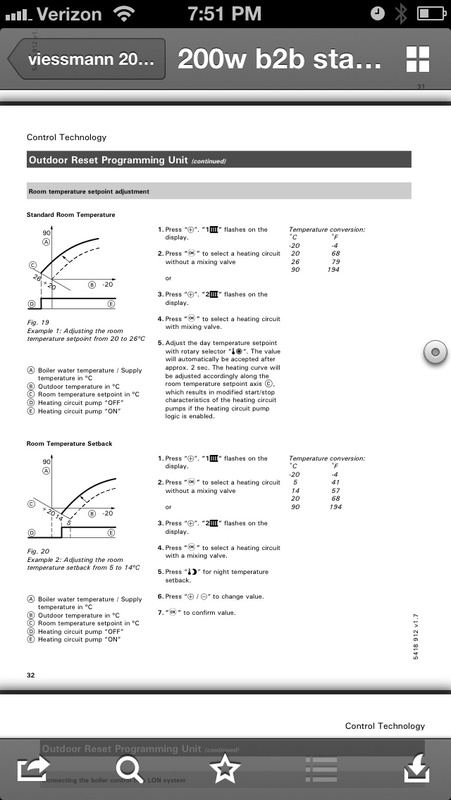 Also, please pardon my lack of experience in hydronics and maybe this forum is in fact only for you the pros - I am disappointed that there were some other questions asked in a previous thread, I have received good first-level replies but after that the discussion was simply left in limbo state. It's too bad if it's all about money. I sincerely hope it's not the case. Thanks a lot Paul. And also to Chris and Bob - you are all top notch guys. ...that makes me believe that such on/off control is still needed (to complement the ODR, not to replace it): If it gets too warm outside (spring or autumn), even if the boiler is a condesing boiler and shoot to lower water temps, it's still having its limit. Including also how low it can open up/modulate the gas valve. In such situations, the boiler may be forced to deliver the water warmer than necessary i.e. a room thermostat or real thermometer will indicate higher room temp than the setpoint temp. So basically, the boiler will always burn a minimum volume of gas per hour, no matter what. Is this scenario impossible and I should not be concerned about it? I am worried that the boiler will fire for too long cycles and with very little pauses in between. Like the situation that some of my neighbours is describing - they were promised that by getting a new, modern forced air furnace (employing ECM motor and modulating valve), that their heating bills will get 30% lower. And to their disappointment, that had never happened. The boiler is going to modulate based on a few things. You would think it is all related to ODR but it is not. Temp Rise or Boiler delta-t is really the deciding factor. If you have a small temp rise the boiler knows your not extracting btu/hr. So she will be modulating low. As your emitters start pulling out the btu/hr and sending colder return water back she will increase the modulation rate and head towards high fire. It's pretty simple..The boiler pump selection is critical. The pump you select is going to move the given flow rate at all times when piped pri/sec or using a LLH. It never changes. In the end the charts mean you need to move the given gpm at the given rise to get the full output of the boiler. Here are the flow rates and pressure drop for the WB2B19. The only factor that can change the entire system btu/hr output delivery of the boiler is DELTA-T or TEMP RISE. Flow is constant and the value of 500 is constant (unless not 100 percent water). So your question concerning how the boiler will react is predicated on the system side design and your boiler pump choice. You need 3gpm on the system side. Do you want a pump moving 6gpm across the HX because you can only take 3 away and the other 3 goes right back into the boiler return? This isn't just Viessmann it's all condensing boilers when piped pri/sec or LLH. If I'm being honest the best choice for this little job is a Lochinvar Knight WH55 and utlitze the variable speed boiler pump option..
is not the only deciding factor in the modulation. Obviously the boiler can also measure the water temp on the return side and understand that either the heat demand was fully satisfied, or to modulate the gas valve / supply water temp appropriately. My question was what happens when the boiler sees a very low delta T between supply and return - will it decide to stop the firing completely, or stubbornly try a sort of minimum modulation and waste gas? It's puzzling that Viessmann's control board does not seem to provide an easier way to interface with on/off system. And that they want you to use the Vitotrol exclusively and we are not sure of how the room temp sensor is being used (i.e. if it can command the boiler/vitotronic to a full stop). And when I was asking about thermostats, I was also thinking that - if one decides to go for Vitotrol 300 (or 200), s/he will have to keep a 2nd thermostat for the cooling system. It would be great if there is a solution to combine them both. Chris, I understand the universal formula between BTU/h, flow rate and DeltaT. But I am puzzled as to why you have included in those sample figures the pressure drop? It's not influencing the BTU, right? You mentioned it only to help with the sizing of a circulator, if my understanding is correct? True, for a heat load of 30,000 BTU/h and a 20F Delta-T (btw is a 20 delta appropriate for steel panel rads, or it's rather for baseboards? ), a flow rate of 3gpm would be needed. So obviously, I would need only a pump which should supply 3gpm, right? And since there is only one circuit and a dP pump to be used, and 3gpm is well withing the Vitodens WB2B-19's allowable range, I guess not even a LLH would be needed. I wanted to go with Viessmann because they are a well respected brand back to the other side of the pond (together with Vaillant). But it's bizarre that the control options are not similar. And also the fact that it cannot drive a system pump conditionally on demand. Let's say that by not integrating a pump inside, is not a super big issue because after all we can use the Alpha or the Bumblebee now, right? It would be great if they were able to drive those automatically. I guess that PMP module is very misleading - they have introduced it in the North-American model just because they wanted a step-up transformer and wished to not bother with re-designing the main boiler board and sensitive stuff such as the igniter/lambda pro. Your application better. You don't have to pri/sec pipe, the boiler can control the system pump and you can have your on/off system. The fire tube HX is used on many boilers. It's the same as the Triangle. I know my friends at Viessmann look at all the post here where Viessmann is the subject. Sorry guys, it is a better fit for the application. Has a much lower end. It is funny to see how subject of thermostats , pumps control, night setbacks comes all the time up.people want control. It is simple, you do not need thermostat, you do not need night setback. You do not need zoning. You do not need control over the heating system. You need comfort and savings. Just set odr , TRVs , and forget about control. System will control itself. On 200 series system pump is controlled by pump module and gets turned on and off when boiler thinks it is necessary. This winter I had a chance to replace brand new German boiler from viessmann competitor. I did not have a chance to put my hands on those boilers and what shocked me is amount of configuration options not needed in real life and low build quality. I guess we get spoiled by viessmann products. Constant circulation, especially this type of application is the way to go. If it was me I would just add the Vitotrol and let it rip. If I was concerned with short cycling I'd add the Caleffi 25 Gal ThermoCon Buffer Tank in lieu of the low loss header. Gennady, are you absolutely sure about your statement: "System will control itself. On 200 series system pump is controlled by pump module and gets turned on and off when boiler thinks it is necessary."? Is that based on your direct observation? Because otherwise neither of those 4-5 Viessmann docs is clear in that respect. Also, would the same behaviour be observed even when there is no separate boiler pump / P/S setup? Gordon, ok, assuming no thermostat and just letting the ODR + vitotronic 200 + vitotrol 300 driving the show, would you be able to tell how often and for how long was the boiler firing vs. not firing (and no pump driven for latter case)? Are those people across the pond suddenly getting crazy in finding out that they are getting better fuel consumption and hydro bills by adding a thermostat and shutting the pumps and the boiler itself completely off when the (real) temp as indicated by the room goes above the setpoint? (I wish to make clear that I have never mentioned in this thread that I would like a setback feature, at least one outside the Vitotrol's control - as Gennady somewhat seemed to imply). What is wrong in having a thermostat being used as a "high temp limit", and for anything below that value it would not interfere with the ODR's logic. It does not matter if ps or other config is chosen. You just pick one when configure boiler. A pump is a pump. Also you can see other info on page I just posted. D and E shows on and off system pump. Just my 2 cents. What Gennady posted. I agree with him. The reason why Viessmann is so vague is that they don't want homeowners and non Viessmann contractors playing with their product. It's been that way since they came to the states. [sorry, again, I can't post anything new as direct reply to a specific person]. I'll open each of them and look for that Fig 35. I do recall seeing it - I can't see too much from your screen capture, but it was something explaining how the heat curves get adjusted and/or shifted up or down. And a "rectangular signal pattern' showed in the background, showing how the system pump or boiler pump is sequencing. But never, ever mentioned black and white that the sys pump will stop when no fire. You see, I never like fuzzy/unclear things. In reply to "Observation - I make a living installing those boilers. So far system pumps do not work in the summer on my viessmann installations". Well, that's a thing I know, that's fine. My question was not about the summer mode (or whatever abbreviation it has). -only one pump, system pump. Preferrably an Alpha Delta-P pump. -pump connected to plug 20A in the PMP. Now, once the heat is satisfied, I assume that the boiler will stop firing (even that question is unclear, to be honest. Because it looks like this ODR principle favors loooong firing cycles and less breaks/stops). But let's say it will eventually stop firing. What will happen after 1-2 minutes of the 'stop firing' moment? Will the sys pomp be commanded to stop via the 20A relay, or not. I appreciate if you can answer this very simple, common sense question. RE: "On another hand you worry too much. You will not figure out all problems you probably will encounter. And system pump operation will be probably smallest one. " Well, my main worries are related to the diffs between the same Viessmann model sold in Europe vs. the one here. My father is good at installing the rads, piping them, manifold circuits, parallel reverse/return stuff, and basic boiler connection, including gas line. What drives us 'crazy' is the ambiguity in the manuals, why is Viessmann so 'uptight', can't figure. I have quite good command of technical things, and it's laudable that they at least provided some drawing for the main board. But they left some connections/their purpose quite ambiguous...Nobody can explain to me what the heck the plug #96, and 143 (terminal 2+3, not 1+2) do! Plugs do. 143 is external demand and 96 is jumped out. It is used across the pond to power accessories. Honestly, I wouldn't want you to instal a Viessmann boiler. Plug 143 seems to serve 2 purposes: Terminal 1+2 is "external demand" and 2+3 is "external blocking". What does the external blocking do? Can you plug a dry-contact 'thermostat' there to tell the vitotronic/boiler to stop functioning? I'm not implying that I would do that, please don't laugh or discard my question. I am simply asking - wish to understand first. Plug 96: shorted out. Ok. Is it an input or an output? Can't understand where that opto-coupler is driving. I presume it's for line voltage form of thermostats - the one like Vitotrol 100UTA/UTD which the former Viessmann 100 was using? hence my intention to find more about it. Ok, you say it won't work. I trust that you know where it's appropriate to be used, and you consider that a dangerous knowldge. Ok, I understand. Thank you. I can see the "Room temperature setpoint adjustment" figures (Fig. 18 and 19) - page 32. There is no figure 20 on that page. The only Fig 20 exists on Page 60 - instructions on installing ODR sensor. Bit of information. Your way over thinking your entire project. You have a constant circulation system screaming at you. Either take advantage of it or move on to a boiler that will give you what you want. You can morph a Vitodens into bang bang operation. Just turn off the supply sensor in Coding 2 and use external demand (143 plug). Now you have an Amercian On/Off Boiler. Best of luck.. I question your reason for posting here. On one hand you asking to explain how system would work in very simplistic and poor configuration, on another hand you asking questions about functions you never will be using unless you will be building complicated Mixed temperature levels loads. I find it very strange and fruitless. We all try to help you if you really need help. But seems you have another agenda. Thank you Chris. But please don't take it the wrong way. I was not implying that I would like to go with a pure bang-bang mode. I was seeing rather as a complementary factor (like an upper temp limiter if you wish - like a guarantee). For the 'normal' operation, when the boiler would nicely work below that temp, the ODR logic wouldn't be affected. And overall, I just wanted to know what the Vitotrol 300 is really doing, if it can offer that function by itself, that's all. Understanding the options first, and then selecting the strategy. If I can know that the PMP via plug 20A can start or stop the external system pump (and not only in summer regime, and in a circuit without mixing valve), and that Vitotrol is a good folk and telling something VERY common sense and civilized to the boiler (like, hey buddy, you went too far, please STOP, don't try to modulate down, because you cannot anymore, so stop firing! ), then I will be a very happy person and not use the bang-bang. Again, don't get me wrong, it's not that I like on/off - on contrary my existing forced furnace works like that, and I hate it with passion. That's why I desperately want to go for this hydronic project, why are these house builders fooling the people with the forced air - don't know but one reason for sure is the money (cheaper and more profits for them). what kind of distribution system are you thinking about? Dear Gennady, rest assured that I have no other 'agenda'. I am a hardworking person and wish to get a reasonable hydronic system installed and looking for some sort of 'assurance' that I'm on the right track with this Viessmann boiler solution. I simply wish to know if my money will be used wisely or not. I thought that my use case and questions were down to Earth and not academic. -pump driven by the plug 20A in PMP module. And outside is not summertime, let's say it's -10 degrees Celsius. There is a head demand, the boiler stars firing. System pump is (or becomes?) on. After a while the heat demand is satisfied. The boiler stops firing. Will the pump stop after a while, until the next firing cycle or not? We are thinking about using a manifold, eventually combined with parallel reverse/return for certain rooms (especially 2nd floor) where we would want fewest piping to be visible as possible. We won't be using monoflow tees/diverting stuff. I was inclining towards using pex-AL-pex, but my father is keen to using copper. In Europe, pex-AL-pex was the 'rage' for the last 15-10 years. But due to poor quality pipe being supplied (to Central/Eastern Europe at least), there were incidents where many pipes simply blew up. And people over there simply oriented towards copper now. It's funny - the opposite is just happening here in North-America. Is the boiler for this application. I told you that before. Your heat load is 30-35k max? What is the min. modulation on the vitodens you're looking at? so, as you indicated originally, your have made that recommendation due to many factors, right? Heat load, smaller 'hydraulic resistance' through the boiler's internal, automation possibilities, right? Shall I presume Chris that you intrinsicly implied that, it's not the fact that the Vitodens cannot accept on/off commands from an external agent (or it can but it's not the preferred use case, to be a 'slave' :-) ), but the fact that even for a simpler form of command - like driving the power to the pump conditionally (driven by its own factors, not external factors, mind you) - it is not able to achieve that, right? Thank you for explaining and re-confirming. I'll try to go with the Lochinvar Knight them. If I can't source it, I'll have to use the Viessmann, so there is still hope for it, rest assured! Is 31 ...Sure direct pipe it...It's not the boiler for the application he wants. He changes his tune across every corner. Better off with the Loch WH55 and it's lower turn down..
People want a more verbose explanation. Bang, Bang and are worried about swing seasons. The Loch allows you to control the pump via 0-10VDC and has a lower btu/hr output. So it will give you the best of all worlds for your application. No pri/sec piping needed. What your missing is you have the opportunity to run constant circulation with indoor temp feedback with communication direct to the boiler. You feel that an external switch is a better way, so go for it..
but you have to buy another box.